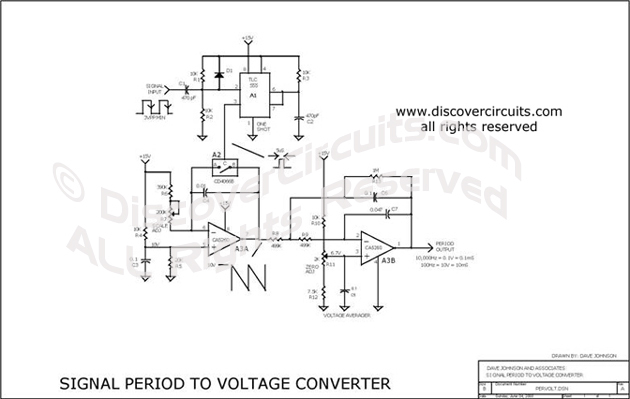 Circuit: PULSE PERIOD TO VOLTAGE CONVERTER __ Circuit designed by David A. Johnson, P.E. On special occasions a design may call for the monitoring of a signal's period instead of its frequency. The circuit shown performs such a period to voltage conversion. The 0.1v to 10v output corresponds to an input of 10ms to 0.1ms. The design is made from simple components and requires only a signal +15 volt supply. A simple C-MOS timer IC (A1) is configured as a 5 microsecond one shot. The resistors (R1) and (R2) bias the timer's input about 3 volts above the triggering threshold. Since the timer fires only on the trailing edge of the input waveform, the input signal does not have to have a symmetrical 50% duty cycle but it does need a fast fall time. Standard TTL levels work fine. An operational Amplifier (A3A) is configured as a classical integrator circuit. The resistors R6 and R7 in conjunction with the capacitor C4 define the ramping rate. Biased at about 10 volts by the resistors R4 and R5 the integrator ramps down from 10 volts to zero volts in 10 milliseconds. The integrator's sawtooth waveform voltage is averaged using an inverting low pass filter (A3B). The filter's components are selected to for a gain of 2 and a 5 hertz knee. The variable resistor R11 is used to set the zero reference voltage (6.67v) so a short input period yields a near zero voltage. The operational Amplifier (A3) was selected to provide near full supply rail swings and near ground level sensing from a signal +15v supply. With the component values shown the circuit produces a convenient 0.1 to 10v output for a 10,000Hz (0.1ms period) to 100Hz (10ms period) input signal. Other scales are also possible using input frequency dividers or different integrator ramping times. This is a test circuit converts a square wave input signal into a voltage. But, the voltage produced is proportional to the time between edges (period) of the signal, not the frequency. The range is from 100uS to to 10mS, which produces a voltage from 100mV to 10 volts. Other scale factors are also possible. The circuit is powered from single 15v supply and uses inexpensive parts. It is great when a signal's period instead of its frequency needs to be monitored.